For over 40 years, Robert Bibler (b. 1948) has combined a fascination with cinematic storytelling, classic filmmaking, and Renaissance art to create a body of beautifully rendered and thoughtful work. 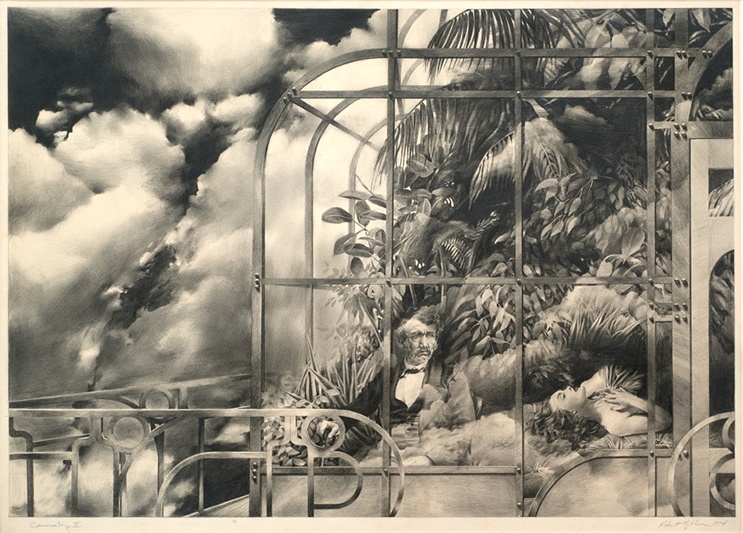 A master draftsman, Bibler embraces figurative representation and symbolism in his surreal, narrative works that distort space and time. This exhibition presents a survey of Bibler’s drawings and mixed media works on paper created between 1974 and 2017. Bibler lives in Salem, Oregon and taught studio art and film studies at Chemeketa Community College for 30 years, retiring in 2003. He also helped to bring classic and contemporary films to the Salem public for 40 years as Coordinator of the Wednesday Evening Film Series. Bibler has exhibited extensively in the Pacific Northwest and his work is included in public and private collections throughout the region. He earned his BFA from the University of Washington and his MFA from University of Massachusetts, Amherst. I enjoy hearing from collectors of my work, and I appreciate receiving any change of contact information, so that I can mail/ email relevant alerts regarding shows such as the one above. In a few cases, art work has changed hands from the original owner, and in the Seattle area, I was not provided with the contact information of purchasers of my work. If you should wish to let me know that you own a particular piece, I would love to hear from you.